His barber just had a coronary. Naruto: So Kakashi, do you think Sasuke has gotten any stronger? Kakashi: Can't you tell; his hair is longer. Naruto: What has that got to do with anything? Kakashi: Hello... Dragon Ball Z. So, your hero has just powered up and you need a way to get this change across visually to your audience. How do that? Well let's see... We have glowing with power. Check. Ground quaking. Check. Muscle mass increased by 300%. Check. Rapid air displacement. Check. But there's still something missing... Ah! Of course! Let's make their hair grow out as well! This is the essence of Power Makes Your Hair Grow. Now however silly this may seem at a glance, most people will immediately understand that they should now be wary of your hero. It's probably because the sudden appearance of long, unkempt hair can make your hero appear rather feral which may be related to therianthropes since they have a habit of growing lots and lots of hair while becoming far more powerful. Also because even if a character can't see the aura of power, and everything else signalling that the hero just got stronger, longer hair is a little hard to miss. Sometimes "justified" with a Slipknot Ponytail coming loose. This is primarily an Anime specific trope, but there are a few non-anime examples out there. Magical Girls are known for this. Subtrope of Anime Hair and Rapid Hair Growth. Sister trope of Power Dyes Your Hair. Super Saiyan 3 is the Trope Codifier. The first two levels change hair color and add lightning bolts to your aura, respectively. The third level increases your hair volume ridiculously. Lampshaded by Babidi when Goku shows him and Buu the first two levels of Super Saiyan: "You've changed your hair, so what?" This drew a lot of jokes questioning what a Raditz (who already has ridiculously big hair) or Nappa (bald) would look like if they achieved Super Saiyan 3. These questions were answered in 2017 by Dragon Ball Heroes: Raditz's ◊ already long hair becomes so long it reaches past his feet, while Nappa ◊ remains bald but his goatee turns into a bushy beard. Also parodied near the end of Excel Saga, where powering up causes various characters to grow Funny Afros. Subverted in the Battle of Gods movie, where Super Saiyan God, a new form that is beyond even Super Saiyan 3, simply gives Goku his normal hairstyle (except it's red). Even characters who don't have hair at all see shades of this trope, such as Super Buu, whose big... floppy... head... thingy just kept growing longer and longer each time he absorbed someone. 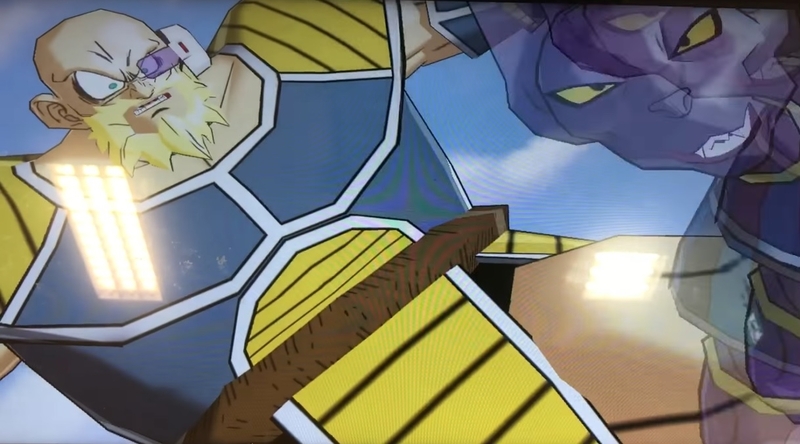 Gohan's first Super Saiyan form simply dyes his hair gold - it doesn't grow and point upwards until he goes Super Saiyan 2 against Cell. 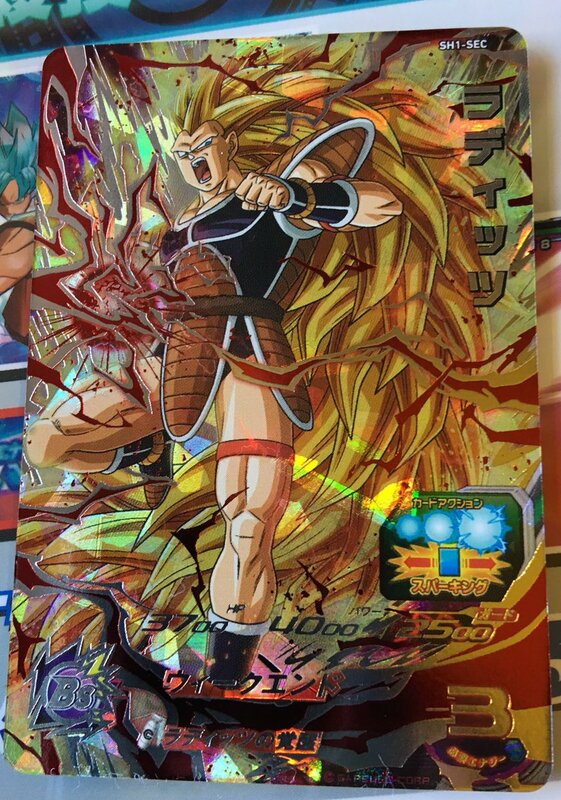 Similarly, Trunks' hair gets a lot wilder when he goes Super Saiyan Grade 3/Ultra Super Saiyan. AKIRA has Tetsuo, whose hair gets longer the more uncontrollable his powers become. However, at the end of the manga and the movie, it's inverted when he turns into a giant bloblike creature due to his powers becoming so great that they need a larger form to manifest themselves. In Angel Sanctuary, Jibril's hair grows back as soon as Sara's soul left her body, a sign that Jibril has regained her power (albeit in a coma). Ichigo's Final Getsuga Tensho form, which may have temporarily made him the strongest character in the entire series, also gave him the longest hair out of any character we've seen so far. Also of note is when Ichigo is fully hollowfied. Also Aizen after his third hogyoku fusion and beyond. From the same series we have Grimmjow, Nnoitra, and Ulquiorra's release forms. Power Mullets have practically become a meme in the Fandom due to how much Tite Kubo abuses this trope. In Crimson Spell, one of the ways you can tell when Prince Vald's transformation into his Super-Powered Evil Side is more advanced than usual is when it causes his hair to grow out. He has to re-do his own Important Haircut after such a transformation in the third volume of the manga. In Cuticle Detective Inaba, the werewolves' transformations almost always grow their hair to ridiculous legnths. In Haruka's case, the hair growth alone tires him out so much that he faints immediately after. Inverted in Date A Live. When Kurumi activates her powers it removes her Peek-a-Bangs, making her left eye visible. Fairy Tail: Well, Juvia and Fried's hair had to grow back somehow. In Hellsing, Alucard's hair grows and retracts according to his power levels (it's fairly short in normal situations, but well past waist-length when dealing with the likes of the Valentine Brothers). In Hunter × Hunter, Gon's hair grows when he becomes ultrapowerful to defeat Pitou. Afterwards he loses his Nen abilities completely as a side effect, but his hair remains long. It might be worth nothing that not only Gons hair grows but his whole body. Before he had the stature of a child and afterwards he has the body of an adult. Neferpitou assumes that what Gon did is age himself to a point where he can defeat them so thats presumably why his hair grew. In Il Sole penetra le illusioni this is the main physical effect of transforming. There are some other changes, mind, but getting much bigger hair is both universal and the most striking effect. Kamichu! : Extreme example. The main character goes from a sort of pageboy cut to somewhere past Rapunzel when using her goddess powers. Tomoe in Kamisama Kiss normally has a short pageboy style hair cut. But when the power limiter Mikage placed on him is removed his hair grows to the point that it is draped over his shoulders and going down most of his back. Kyo Kara Maoh! : In the anime only, when Yuri taps his Demon powers, his hair suddenly grows and he seems to gain a more mature air. It reverses back to his boyish mop once the effort is done. Rio of Magical Girl Lyrical Nanoha Vivid has her short, tomboyish hair growing all the way down to her waist whenever she accesses her combat form. Mahou Sensei Negima! : Negi Springfield during his lightning-god form. His hair becomes as long as he is tall... sort of, as it turns into energy/lighting about halfway down. In Naruto, all of the characters with a Cursed Seal have their hair get at least slightly longer when they go into Stage 2, except Jugo, which is funny considering the Cursed Seal comes from him. Jugo's psycho persona has a considerable amount of control over his transformation; considering there'd be no actual benefit to changing hair, it doesn't. By comparison, the others have to essentially give in to the seal to actually use it. In One Piece, when Carrot enters her Sulong form under a full moon, her hair changes from short and blonde to pure white and longer than she's tall. Luffy's hair appears to grow longer and wilder when he's using Gear Fourth's Snake Man form but it's nowhere near as exaggerated as the above example. In Pokémon Adventures, when Caitlin loses control over her powers, her hair grows drastically in length and starts attacking people. In Prétear, Mikage's hair grows well past floor length while she's floating when she transforms into the Princess of Disaster. It is shown in a later scene that she is actually quite short in proportion to Sasame. The hair all disappears in the finale when Sasame dies and she returns to her normal human-Takako form. In every season of Pretty Cure, whenever the Cures transform, most of the time their hair grows and changes color. Not only that, but they also get different hairstyles (for instance, Tsubomi's red pigtails become an extra long pink ponytail whenever she transforms into Cure Blossom). Transforming into a Super Mode can then make a Cure's hair grow a second time. Smile Pretty Cure! goes even further, as the girls get one instance of hair growth when transforming, a second when changing into Princess Form, and a third when changing into Ultra Form. While Usagi already had Rapunzel Hair, in the manga and Sailor Moon Crystal it grew to absolutely unmanageable lengths after she became the Moon Princess for the first time. She locked herself in her room for several days as a result, and the Senshi had to cut it short for her. Also Lampshaded later on by Mistress 9 after she takes full possession of Hotaru while complaining about how inconvenient super-long hair actually is. Note that her hair invariably trails off-panel in every shot she's in. In the first anime, however, not only does she not complain about her hair being inconvenient, she ties her enemies up with it. Both Hakkai and Goku support this theory in Saiyuki when they remove their power limiters. SHUFFLE! : When Asa finally uses her magic to save Rin's life in the final episode. It shows her later with her hair braided down to her hips. In Umi Monogatari, both Marin and Urin get this when transformed. Kanon just gets Idiot Hair and a different color/shape to her hair. When Ushio of Ushio and Tora uses the power of the beast spear, it usually results in him growing hair past his legs. Should he draw on a remarkable amount of that power? Bring a comb (seriously, it's the only way to bring him back). Happens to Yuuki Cross from Vampire Knight, after her vampire powers are unsealed by Kaname. While this happens in Yozakura Quartet whenever Akina uses his tuning ability, it's not as drastic as some of the other examples here. Yu-Gi-Oh! is somewhat of an example. Bakura's hair becomes much 'poofier' when he becomes his evil alter ego. When Marik goes evil it his hair stands straight up. Yugi/Dark Yugi is a smaller example, with some of his yellow bangs spiking up. He also gets more 'points' and more layers to his hair. YuYu Hakusho: Near the end of the Sensui arc, Yusuke awakens from near death as a half-demon and has long, unkempt hair down below his waist, among other cosmetic changes. (It doesn't stick, though, as he asks Kurama to cut it back short. Notably, it happened around a year before the SSJ3 in Dragon Ball was introduced. In Digimon Adventure a few of the Digivolutions result in the Digimon gaining more human forms and long hair as a result. Birdramon to Garudamon, Gatomon to Angewomon, Patomon to Angemon are examples. Enrico Pucci of Jojos Bizarre Adventure grows a ponytail when his Stand evolves to Made in Heaven, its final form. Doc Samson of Hulk Comics has long hair every time he gets into his power phase. It also seems to happen to She-Hulk — since with her height increase her hair would have to be floor-length in her petite normal form otherwise. Definitely applies in the 90s cartoon, where normal Jennifer has bobbed hair. Of course, there's Doctor Banner himself. In The Bronze Age of Comic Books, the Hulk had a shaggy mop and Banner's hair was usually neatly trimmed. In the Modern Age, the reverse is often true: Hulk is often crew-cut, and Banner occasionally drifts close to Mad Scientist Hair, particularly when he's in The Madness Place. In an unusual an amusing reversal, the RED Hulk has a mustache in his unpowered form, which vanishes completely when he powers up. Originally, of course, this was to keep his identity a secret from the readers. Another reversal exists in Carol Danvers during her time as Binary. Depending on the Artist she's depicted with either Flaming Hair or a corona of energy crowning a shaven head. Anytime Jules activates her powers her pigtails grow from barely reaching her ears to all the way to the floor and then some. It's not just for show as she can use her hair to attack, or wrap around her enemies. In the original Will's remained normal, Irma and Taranee's grew somewhat (with Taranee's having a massive change in hairdo) and Cornelia and Hay Lin (whose hair normally reach their lower backs) got their hair close to their calves. With the New Power arc Will's hair grows a bit, Irma and Taranee get full-on Rapunzel Hair, Hay Lin's hair remains the same length of the previous transformation but increases in quantity and gets in a new and more complex hairdo, and Cornelia's hair remains exactly as in her original transformation. Will's ability to glamour includes literally growing her own hair and wearing it in different styles, as she demonstrated once. When David Landers of DP7 gained his powers it also came with Rapid Hair Growth giving him excessive body hair and necessitating a shave of a, relative to his height, foot-long beard and locks every day. Ironically it also made him bald on the top of his head. In the Lyrical Nanoha fanfic Infinity, Arf's hair grows about a foot in length when using 50% of Fate's Linker Core instead of the usual 5. She doesn't question it since she's seen several shows on Earth that abide by this rule. Inverted in Tangled. Rapunzel grows out her hair because her hair would lose its powers if she cut it. Wonder Woman (2009): Part of Ares' One-Winged Angel form is his hair going from short and close-cropped to ankle-length. In Scott Pilgrim vs. The World, Todd's psychic powers make his hair spike when in use. Upon losing them for violating his veganity (long story), his hair sinks back down over his head, limply. Demon Of The Lute - a bald guy goes full-on troll doll about two minutes in . The healing rings in the Infinity Blade novels work by speeding up the body's natural healing processes, so each use ages the hero about six months - and causes him to grow about six months' worth of hair and beard. Paige's shoulder-length hair grows down to her waist when she is turned into a wood nymph. Phoebe's hair turns blonde and goes down to the floor when she is turned into a Greek Goddess (based on Aphrodite). Phoebe's hair goes blonde again and becomes longer (though it's up in a bun) when she is turned into a genie. It's meant as a Shout-Out to I Dream of Jeannie. Again when Phoebe becomes a banshee her hair becomes waist length and white. When Wyatt turns into his evil future self, his short hair grows to shoulder length. Leo's evil self has longer Spiky Hair while Chris's evil self has a ponytail. Most of the Riders from Kamen Rider Ex-Aid have SCULPTED Anime Hair on their helmets, most especially the titular Rider himself. So when he gets the franchise-standard Super Mode, not only is it extremely gold and sparkly, his helmet's hair grows into long tendrils...that are [[Prehensile Hair prehensile]]. 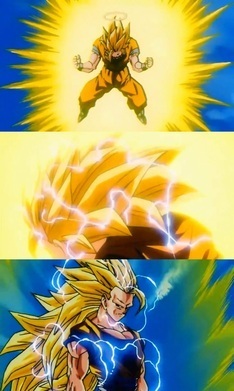 Comparisons to Super Saiyan 3 and, appropriately given the show's video game theme, Super Sonic immediately sprouted upon the design's reveal. In Infinity Game when Hai An transforms into a paladin his hair grows extremely long. This only happens to him and nobody has any idea why. Inverted in the story of Samson. He was blessed with super strength so long as he continued to grow his hair out and lost his divine powers once it was cut. Dr. Dude's hair gets noticeably larger after his transformation. Taboo Sho Minamimoto in The World Ends with You. Giana of The Great Giana Sisters grows a punk hairdo when becoming super. Koujaku from DRAMAtical Murder when his Super-Powered Evil Side takes control of his body. In the bad end, his hair even changes color. Pokémon: When Ampharos Mega Evolves, it gains gorgeous white flowing hair, giving it the nickname "Amphabulous". The Mareep line as a whole inverts this since Flaafy has noticeably less hair than Mareep, and Ampharos (outside of its Mega Evolution) is completely devoid of hair. Lucario doesn't get hair, but he gets a gigantic fluffy tail. A strange case with Mega Mewtwo Y, who doesn't get hair but its tail moves to the top of its head, looking like hair. Mega Altaria looks like a bird piled with cotton. It even has a hat made of cottony stuff. Yun from Mana-Khemia 2: Fall of Alchemy has a pretty short cut in his everyday form, but it grows out along with his horns and claws when he enters battle, and even more when he uses his Limit Break. Several characters in Inazuma Eleven 2 get longer, often wilder hair while under the effects of the Aliea Meteorite. When Street Fighter V newcomer Necalli activates his V-Trigger, his hair turns a fiery red and stands on end. In the Eternal Calm prologue to Final Fantasy X-2, Yuna is shown in her default outfit from the first game. But when Rikku presents her with a Garment Grid and she spherechanges into the gunner dressphere, Yuna instantly gains a a braid that goes all the way down to the floor. After undergoing the Hope Cultivation Program, a surgical operation which granted him every Ultimate talent in existence, Izuru Kamukura from Danganronpa has hair that reaches to the floor. Compare that with the very short hair of his talentless pre-surgery identity, Hajime Hinata. Justified in that the program also removed his original personality, emotions, memories, and anything else that was deemed to be an obstacle in the way of him acquiring more and more talent, so the only reason his hair is so long is because his lack of emotions means he just doesn't care enough to cut it. Susan's hair grew to knee-length when her magical power and angst received a major spike. She cut it later back to its usual length, presumably with Justin's help. It also seems to be happening to Nanase. Despite having burned out her magic, her hair is growing back rapidly as compensation. Tedd theorizes that this is because she is still generating magic power as normal, but doesn't have a way to use it, so her body is expending it by making her hair grow since that's a safe outlet. This also happens to anyone who is zapped with the V5 beam. The Fan has Pete, a character with short trimmed hair. His hair grows to ridiculous lengths and turns gray (along with his skin turning brown) when his earth-based powers are activated. When he reverts back to normal, he simply sheds it. In Namesake, Elaine's hair which she wears in a bob grows long enough to drag on the floor within moments as her muse powers activate. She's anything but happy about this, as she's constantly tripping over it. In The Order of the Stick, Vaarsuvius' hair grew from a bob to waist-length after s/he made a Deal with the Devil in exchange for temporary ultimate arcane power. It stayed that way afterward, and s/he now wears a ponytail. This happened to Anne Onymous of The Wotch when she sees Robin critically injured and goes into an Unstoppable Rage. Gunnerkrigg Court: While merely due to Art Shift, Antimony's hair extends and flows over the page , even joining with her head at multiple points on the page, when she uses her blinker stone. In the Global Guardians PBEM Universe, the Israeli superhero Shimshon (the Hebrew form of Samson) has Super Strength that, like his mythic namesake, disappears if his hair is cut. Parodied in Codename: Kids Next Door's teasing of the Super Saiyan transformation, where Numbuh Four gains a 4-foot hairstyle but doesn't actually become stronger, and is promptly kicked away like a soccer ball. She-Ra: Princess of Power: A less extreme example than most: Adora gained about a foot or so of hair upon transforming into She-Ra. The Rowdy Ruff Boys when they're brought back from the dead. Sedusa's power comes partly from her Prehensile Hair, which the girls cut off when they've defeated her. She later gets her hands on a powerful artifact that gives her more power - and also grows her hair back in the form of snakes. The power of aglet awareness made one guy's hair grow back in the Phineas and Ferb episode "Tip of the Day". Princess Luna, when she appears in the second season, has her mane and tail much longer (not to mention flowing and ethereal) than in her de-powered form seen at the end of the pilot episodes. That's nothing to say of Nightmare Moon, whose mane was long enough to form a city-hall-filling funnel cloud made of stars. When the Mane Six are bestowed the Rainbow Power, it has this effect. Tirek gets a long white mane in his penultimate transformation. In My Little Pony: Equestria Girls the Mane Six's Magical Girl forms have Rapunzel Hair pony tails. At the end of the post-movie Rainbow Rocks music video "My Past is Not Today", Sunset Shimmer gets Super Saiyan-style hair as part of her anthro-phoenix transformation. In Winx Club, Tecna's pixie cut hair grows to be shoulder-length in her Enchantix form. As in the comic, there's a slight length change whenever the heroines of W.I.T.C.H. take up their Guardian forms. Most notably, Cornelia's hair grows more than usual (and not just thatù) in "N is for Narcissist" when she ends up wielding all five elemental powers. Raven from Teen Titans when Slade rips off her costume and activates her birthmarks. She's seen in the next scene trimming it back down to its normal length. All three princesses in LoliRock get noticeably longer and brightly colored hair while in their Magical Outfits. In Dr. Dimensionpants, Kyle's hair goes from being short and light ginger to a tall black mohawk with a white lightning bolt-shaped streak whenever he becomes his alter-ego. As well as this, he also gains a mustache. In one episode, his pants get mixed up at a dry cleaners with a skirt belonging to his female counterpart Dr Dimensionskirt, forcing him to don it in battle and grows long wavy brown hair as a result. In Miraculous Ladybug, when Adrien transforms into Chat Noir, his hair grows over his normal ears so that only his fake cat ears are showing.